A post about the difference between socks proxy and HTTP proxy, how to get, check and use socks proxy or HTTP proxy. There are two types of proxy, socks proxy and HTTP proxy. When we say “proxy” or “proxy server” without the type, we are usually meaning HTTP proxy. The most proxies we find on the Internet are HTTP proxy. HTTP stands for HyperText Transfer Protocol which is used in surfing. It means HTTP proxy is used for surfing in browsers. HTTP proxy may be configured to either reveal or hide the end user’s IP address, depending on the administrator’s preference. Proxy Anonymity is determined by whether or not the proxy reveals your real IP address. There are three levels of HTTP proxy according to the anonymity. Highly Anonymous Proxy (Level 1): The web server can’t detect whether you are using a proxy by the information your browser sent. Anonymous Proxy (Level 2): The web server knows that you are probably using a proxy, but it can’t detect your real IP. Transparent Proxy (Level 3): The web server knows that you are using a proxy and it can also detect your real IP address. Socks proxy is a versatile proxy for all your Internet usage while the HTTP proxy can only be used for surfing. You can use socks proxy to send email, transfer files, chat online, play games as well as surf websites. There are two versions of socks proxy: version 4 and 5, as known as socks4 and socks5. Socks5 supports UDP (VOIP needs it), name resolution, and authentication while Socks4 not. However, in most cases, you won’t use those features. Then Socks4 is same as Socks5. Socks proxy supports high anonymity and HTTPS (secure HTTP) naturally. All the socks proxies are highly anonymous. Every socks proxy support HTTPS websites (such as Paypal). You can hardly find HTTP proxies supporting both high anonymity and HTTPS. There are two shortcomings of socks proxies. 1) Socks proxies are much less than HTTP proxies. 2) Fewer programs support socks proxy than HTTP proxy. Because proxies die fast, you need to check them before using them. 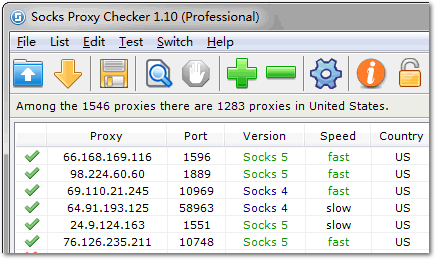 You can use the free edition of our software Socks Proxy Checker or Elite Proxy Switcher to check the socks proxy or HTTP proxy. Most browsers support both socks proxy and HTTP proxy. Double click the socks proxy or HTTP proxy in Socks Proxy Checker or Elite Proxy Switcher to set it as the active proxy for your browsers (IE, Chrome, and Firefox). 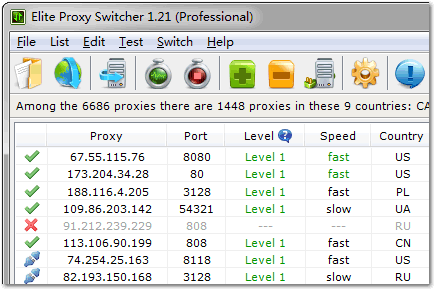 Please read this post if you want to use socks proxy in other programs besides browsers. You can get some free socks proxy and HTTP proxy from us. You can also buy socks proxy and HTTP proxy list from us. Previous Previous post: Proxy Checker: Am I Using a Proxy?